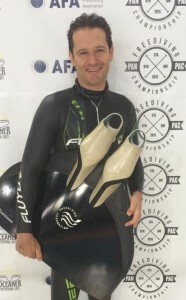 Daron Joseph, a swim instructor and freediver from Newcastle, NSW, attended the Pan Pacific Championships as his first freediving competition. Daron has written up his reflections on his first competition, what he learnt, and what he plans to work on for future events. This little piece is a very handy insight into the feelings and emotions of a first competition – and the lessons learnt are a valuable toolkit for anybody thinking about their first freediving competition. 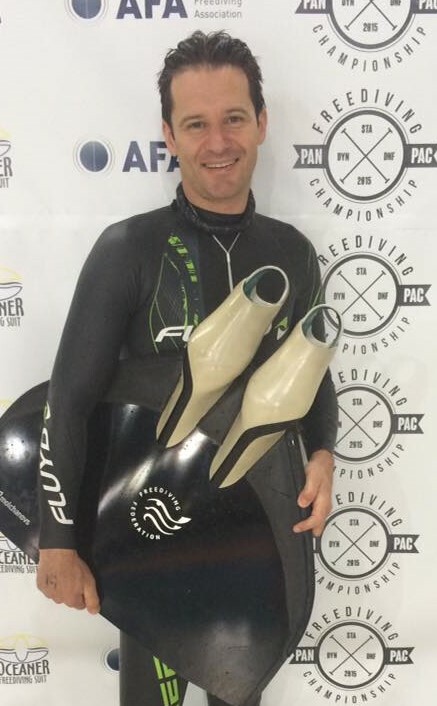 We’d like to thank Daron for letting us post and share this, and look forward to seeing his progress in the Australian and international freediving scene. This reflection of my experience at the Pan-Pacific Championships is meant only as a guide to provide insight and support for competitive first-timers. In mental preparation to this event, I had already locked in the intrinsic motivation to use this competition as a learning tool. Little did I anticipate to the extent that this experience would evolve me as a freediver. Over the three days of competition I met national and world record holders that were only too happy to share some of their experiences both white card (white card is a clean performance) and red card (red card is a disqualification) moments. Day one of competition I felt good. I felt focussed and under the circumstances, pretty relaxed. This day I performed a static (STA) Personal Best (PB) in the pool of 5min 20s and came up clean receiving a white card, so far so good. I managed to stay relaxed and just tried to remember my training. In preparation for day three, I took things really easy for the rest of the day. The weather in Brisbane was very hot (+30C) so watching what I ate, drinking plenty of water, resting and some light stretching was a must. Well I found it very difficult to sleep this night and hoped that with a later Official Top (OT) I could rest up at the aquatic centre, ready for another performance swim. Day three, Dynamic (DYN) and I just tried to remember my training and all the good advice that had been given to me. I did four warm up laps of different speeds and with different purposes. With five minutes before OT I figured it was time to chill out (relax) but remain warmed up. It was at this time I realised that my breathing was irregular. With that, I removed my nose clip and began breathing through my nose… ahhh… that’s better! Straight away I started to relax, to the point that I started talking to myself and allowing my shoulders to slump and further relax. One minute from OT and the nose clip goes back on slowly. Three final breaths and I’m feeling totally in control and relaxed, yet mildly curious as to how this swim will go. I pushed off from the wall and I started talking to myself. Again, the voices of advice pop into my head and I follow the guidance of world and national record holders. I turn at 50m and all’s well… I turn at 100m and I feel the best I’ve ever felt after a 100m swim, “keep going” I say to myself. I’ve reached my 5th kick, kick, glide cycle, there’s the 6th and I know I’m on a new PB. Two more cycles and I know I’m close to the wall and still feeling ok so I have a quick look forward, yes it’s very close. I finally see the dark ‘T’ lane marker and I glide to the wall. Little did I realise that I was too deep in the water and I had swam under the diving blocks, I do a full turn and now I’m busting, I kick out and reach up for the lane rope floating on the surface. At this point I know I’ve swum a new PB which makes me very happy, I take one breath, so far so good, then go for another but I haven’t fully recovered yet… I drop back into the water just before I can take a second breath and double dip. The next thing I know I have a safety diver grab my arm and already I know my effort has earnt me another bloody red card. So where did I go wrong?!?!?! From what I can remember, I believe it was a few things. For example, not trying to better a PB by more than 10%, even if you feel good at the time, after a big performance and a blackout the day before is probably a good place to start. This review of my experiences at the First Pan-Pacific Championships has proved to be an amazing learning experience and provided me with a framework for future competitions. With the insights and support that this beginner competitive first-timer has been given, I feel blessed to have met the group of people that I did. Where to from here? Well for now I’m taking a few weeks off from any breath hold training. In the short and medium term – put on some weight and improve my fitness. Then back to the pool where I am very keen to implement the praxis of this learning experience and achieve my goals of big performance with white cards all round. Some notable things I also took away from the Pan-Pac experience was the awesome camaraderie, mateship and sportsmanship from all the competitors, where people from all walks of life shared information, skills, knowledge and humbly shared their personal experiences both positive and not so positive as well as providing constructive advice on how to modify poor technique or state of mind for example. On a very person note, one inner conflict I had to deal with was my ego vs my inexperience. The mindset that ‘I can do this!’ verses ‘can I do this?’. In answering this question especially during a performance swim, I have been advised to simply “listen to your body”. However, easier said than done when you feel rough at a 100m DNF and you know you can swim 125m (this was part of my undoing). This ability to listen to my body and how it is feeling in the moment and not what I have swam in the past will be something that I will pro-actively be developing. So as a first time competitor in a freediving comp my suggestion is to do the workshops even if you think you know heaps about the topic, remember you are there to learn. Get your technique right, those 1%-ers add up, if little things are going wrong or not right, then how can someone expect the big things to work effectively, for example buoyancy, arm action, or over breathing to name but a few. More things to consider are mentioned below. While it’s tough at the time, I am more determined now than ever to have white cards all round at my next comp. This comp has made me more determined than ever to know my limits and not discover what I might be able to do during a performance swim or static. So weather you manage to white card a big performance or not in your first competition, another valuable lesson I learnt was that one should be prepared to take 10 – 15% off their next performance from their PB. You’ll notice the following points of interest are kept brief. As stated, this is a guide, not a manual. Therefore, if you are serious about reaching your potential as a competitive freediver, then you’ll need to do your research – read up, watch, listen and learn from people more experienced than you and you will, in time, get to know your capabilities. Do a comp, use it as a learning experience. Ensure perfect buoyancy – too deep or too shallow = takes away from the performance swim. Keep warm while waiting for Official Top (OT), don’t get cold.